413 The W.C.T.U. met in the home of Mrs Harris. 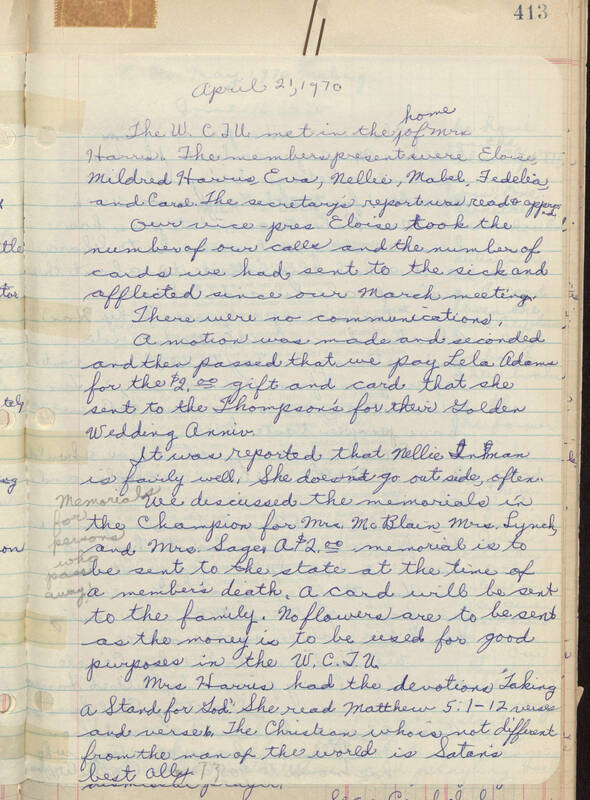 The members present were Eloise, Mildred Harris, Eva, Nellie, Mabel, Fedelia, and Carol The secretary's report was read and approved. Our vice-pres Eloise took the number of our calls and the number of cards we had sent to the sick and afflicted since our March meeting. There were no communications. A motion was made and seconded and then passed that we pay Lela Adams for the $2.00 gift and card that she sent to the Thompson's for their Golden Wedding Anniv. It was reported that Nellie Inman is fairly well. She doesn't go out side, often. We discussed the memorials in the Champion for Mrs. McBlain, Mrs.Lynch,and Mrs. Sage. Memorials for persons who pass away. A $2.00 memorial is to be sent to the state at the time of a member's death. A card will be sent to the family. No flowers are to be sent as the money is to be used for good purposes in the W.C.T.U. Mrs Harris had the devotions "Taking a Stand for God." She read Matthew 5:1-12 verses and verse 16. The Christian who is not different from the man of the world is Satan's best ally.